I've waited nearly a year to review this.. I guess I was waiting for the perfect timing to do so. 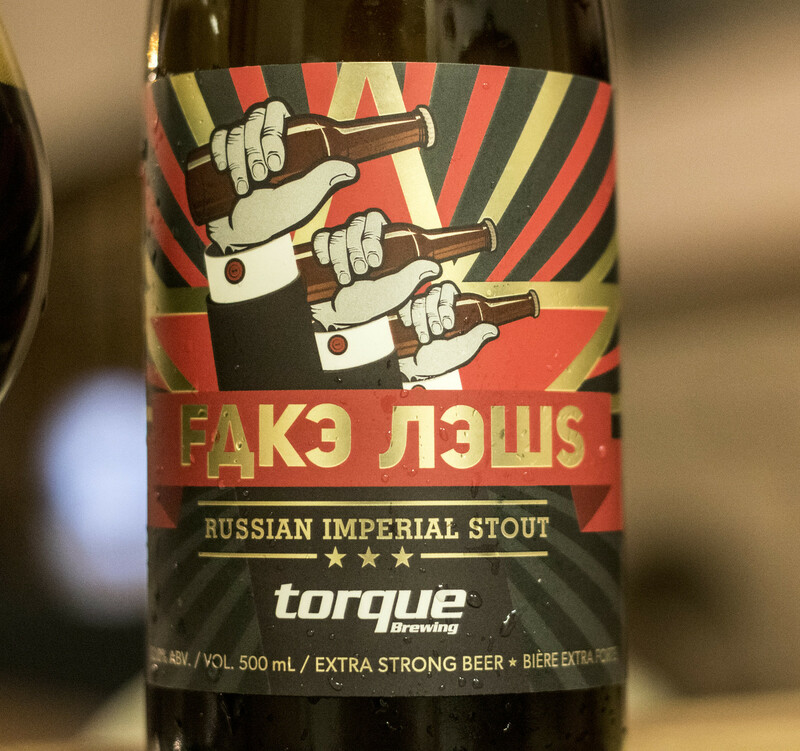 Torque Brewing's Fake News got a bit of media attention because the beer is mocking Trump and his ties to Russia.. and his love of "fake news". Fake News is a Russian Imperial Stout that's 10% ABV & 65 IBU and is described as velvety, bold, hint of smoke (and mirrors). Appearance: Pours a thick, black dark-as-the-night stout with a rich burnt caramel head on it. It starts out with a liberal amount of head but gradually diminishes, leaving behind a bit of a light burnt caramel lacing on the glass. 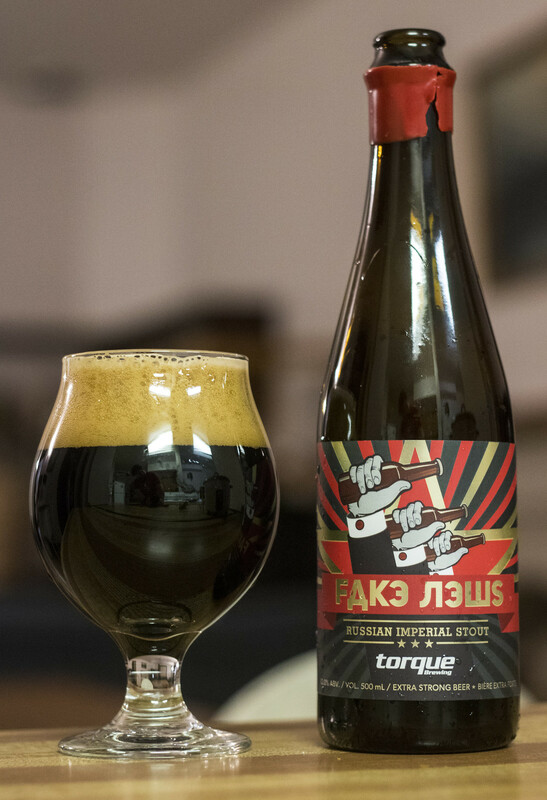 Aroma: Rich, boozy, sweet - everything you'd expect in a Russian Imperial Stout. Rich roasted coffee with a bit of vanilla, a good amount of booziness, caramel, cocoa, and a bit of earthiness (peat) to it. Taste: The first thing I noticed was how thin this RIS was on the palate before I even got a chance to decipher the flavours, a bit surprising as I was expecting it to a bit thicker. The first flavour I get is a rich roasted malt profile to give off a rich coffee-like flavour to it. There's a good amount of booziness to it as well as a nice amount of dark fruit presence to it (such as raisin). Good amount of cocoa in there, a moderate amount of caramel, a hint of smoke (and mirrors!) and a bit of an earthiness at the very end. I can definitely feel the booziness popping up only after a few sips. Overall Thoughts: While the mouthfeel was thinner than I liked, it was a solid Russian Imperial Stout otherwise. It had everything I want in a RIS - rich coffee-like malt profile, good amount of chocolatiness, some booziness and perfect for Manitoban winter weather. I expect a barrel aged version of this to come out one of these days. This beer pairs well with their awesome cast iron bottle opener, which you can pick up at their taproom! I'd like to say thanks to the awesome folks over at Torque for sending me a sample back in March, I would've never been able to try this beer otherwise.